It was to Brymbo that John Hughes, one of the first of two missionaries (Owen Davies was the other) was sent by the Wesleyan Methodist Conference to establish Welsh Wesleyan Methodism in Wales. On 23rd August 1800 John Hughes preached the first Welsh sermon for the Wesleyan Methodist Church at Brymbo. He preached twice, at 10 a.m. in English and at 6 p.m. in Welsh. An English Wesleyan Methodist cause was already established at Brymbo and, for a time, the first Welsh Wesleyans worshipped at the same place as the English Wesleyans. A Mr. Stephenson, a lay preacher and a "works" manager, bought a parcel of land and had three houses and a Chapel built on it. That was about 1804. Mr. Stephenson sought more authority for himself and turned against whoever was not in his favor. Eventually he himself fell foul of a Mr. Wilkinson, the owner of the "works" and was relieved of his position as manager. He then sought of the Welsh Wesleyans to buy the Chapel but the Superintendent Minister flatly refused maintaining that some of the members of the church had themselves contributed towards its building. Later the Chapel was sold to a John Edwards, Gyfynys, who charged the church members an annual rental of £8, which became too much for the new members to pay. Church membership fluctuated, at times no more than ten. When the membership increased, it was decided to leave the Chapel and a move was made to an upper room at Blast Furnace where the church worshipped until apiece of land, measuring 16 yards by 13 yards was bought at the Mount and a Chapel built on it. The Chapel measured 12 yards by 11 yards and cost £205, the money being loaned by three of the members. Among the earliest leaders were Thomas Rogers, William Pritchard, Thomas Charles, Joseph Fisher, and John Hughes. The Chapel was opened October 1/2, 1837. The cry for a new Chapel was soon heard and in 1863, it was decided to press ahead to seek permission to build a new Chapel on the same site. It was opened on September 4th, 1864. It cost £800 and entailed a heavy debt, which took years to reduce. Then, in 1890, it was decided to build still another new Chapel. It cost £2,480 and even with a loan and grant from the Connexional Chapel Committee of £700 and the £400 proceeds of the sale of the old Chapel, a debt of £1,250 remained. 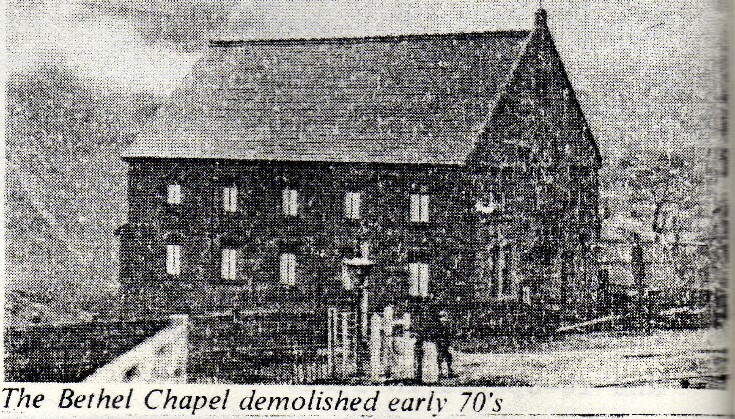 The new Chapel had seating for 600, with a large Schoolroom and smaller rooms, it was in use until about 1972 when, because of dwindling membership and the loss of leaders, it was decided to terminate the cause and sell the Chapel, which was bought by the owners of Brymbo Steelworks. The Chapel, situated as it was at the foot of the ash tips from the Steelworks, suffered damage from time to time by falling clinkers and claims for damage, from the owners, were not always successful. After closure the remnant of members transferred their membership to other churches within the circuit or to churches of other denominations, English or Welsh. Many concerts took place in this Chapel and it was noted for its "Good Friday Concert". Many fine artistes performed here, including Isabelle Bailey, Heddle Nash, Trevor Jones, Harry Mortimer and many others.